I remember being in the hospital bed on that sunny morning in July 2005. I hadn’t been at the hospital for long. When G decided to arrive, he came fast. I wasn’t even admitted until after I delivered my baby boy. My first child. It was early on a Saturday, and it didn’t take long for the maternity ward to became bustling with activity. I was lucky to get there before the crowd arrived. I enjoyed the quiet corner room with a view of the healing gardens outside. While I was in pain, and probably a bit in shock from my first experience with childbirth, I couldn’t have been happier. Or more in love. At some point during my hospital stay, I got a surprise (and welcomed) visit from the mom of a woman who attended our child birthing classes at the hospital. The classes were fun and really more of a support group for expecting first time parents. The mom had attended most of the classes with her daughter and was also a volunteer at the hospital. We bonded in those classes. My visitor congratulated me and then told me that a woman from our class delivered her son stillborn a few weeks earlier. I felt the air sucked right out of me when she informed me of this fact. How could it be? She was just like me. She was doing everything right. She was healthy. How could she lose her baby? I don’t know the details and I didn’t have her contact information to tell her how sorry I was. And, honestly, I’m not sure I would have known what to say if I did. Sadly, parents lose children every day. I cannot fathom the pain a mother must feel when she loses a child. And it doesn’t matter how old the child is. From conception, that child becomes a part of you. 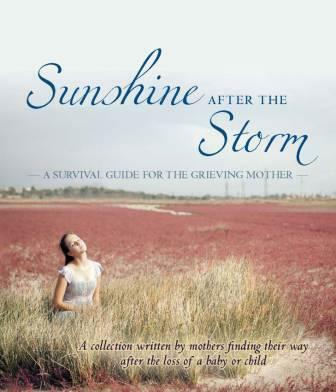 Back in October, my good friend Alexa Bigwarfe made her editing and publishing debut in Sunshine After the Storm: A Survival Guide for the Grieving Mother. It is a compilation of heartfelt, hope-filled stories to encourage bereaved parents that came about after Alexa’s friend lost her full-term baby. She wanted to impart her knowledge as a grieving mother and provide her friend with everything she needed to survive the terrible ordeal. After reading the book, I realized that it is also a guide for those who have someone in their lives who has lost a child. Reading the stories painted a picture of the emotions that parents go through when they experience a loss, whether it was an early miscarriage or an older child. The feelings of isolation and sheer pain. Not knowing what to do next or when/if they would heal. The contributing authors share their very honest, personal and different experiences with loss and grief. There are helpful tips throughout the book for those who are in the midst of dealing with a loss. There’s even advice on what to say (or not say) to a mother who has experienced a loss and several resources for grieving parents to utilize and find support. I particularly liked the stories from the men who were able to communicate how different the grieving process is for fathers. Most importantly, there is a theme of hope beautifully weaved throughout the guide. I share this book with you on a Philanthropy Friday because Alexa, being the advocate that she is, has also started Sunshine After the Storm, Inc. The nonprofit aims to raise funds in order to provide the book free of charge to hospitals and bereavement groups. Alexa is currently raising money for Sunshine After the Storm, Inc. through GoFundMe. It doesn’t take a lot of money to ensure at least one book is donated. You can read more about Alexa’s story in a November 2012 Philanthropy Friday post called For Love of Kathryn. I also encourage you to read her blog, No Holding Back. You can purchase a copy of Sunshine After the Storm on Amazon.com in print or Kindle version. Do you know someone who could use this book? I am too, Alexa. It is a beautiful book that I hope gets distributed widely! What a beautiful post about this absolutely beautiful book. Oh Lisa. You have been such an an amazing supporter (and Ashley too!) This made me tear up! Thank you so very much! Hugs Sister!!! Thank you Janine! You have been an amazing supporter! It’s a great book, Janine. I agree that it’s inspiring for anyone! anotherjennifer recently posted..Download My 2014 Editorial Calendar! You are so sweet Ilene. And for the record, I am so proud of you too!! Jennifer, this is such a wonderful story to share for Philanthropy Friday. Alexa’s advocacy and desire to help other grieving parents is an inspiration to all. Agreed, Nicole. I might have to make here contributor here. Alexa’s made it in several of my philanthropy posts! I was pregnant with my son, the 9th month, I was at my OB/GYN office. My doctor was over an hour late for my appt and I was getting very upset. When she finally saw me, I noticed she had been crying. She apologized for being late, saying there was an emergency. Later that day I found out from another mom to be in my Lamaze class that one of the women in our class had lost her baby. It sucked the life out of me. I didn’t know how to respond. Though I didn’t know her well, had met her for the first time in the class and we had dinner as a group a time or two, I wanted to reach out, but didn’t know how. I wanted to go to the funeral but couldn’t make myself do it. To this day I still feel bad that I didn’t reach out better, didn’t know how to reach out better. I think your book will be a blessing to so many people. Thank you Carla, for sharing that story. I hope that it will help many mothers. It’s the most awful thing to go through alone. Thank you for sharing, Carla. I think a lot of us don’t know what to do or say and so we don’t do anything at all. Myself included. This book is so helpful. I learned that the most important thing is to just be there. I lose my breath every time I read a story like that one Jennifer… and I really don’t believe there is a more powerful book worth buying. You know how much I adored this book and my wish is for it be in every home and every hospital and everyWHERE for EVERYONE. There is a great need and a great mission to be filled. Alexa- you inspire me. I have this book and I’m in the middle. I do know too many people who could use it. Just too many. It is not something I experienced myself, but, like Chris said – I lose my breath when I hear about it. Whether it’s a friend, a family member, or a stranger. Tamara recently posted..When Co-Authors Team Up! How could you not, especially as a mother. My heart aches at the thought of a child losing her life. What a beautiful review! I read it on the plane coming home from Bloggy Boot Camp in Dallas and cried the whole way. This is a book that should be in every hospital. 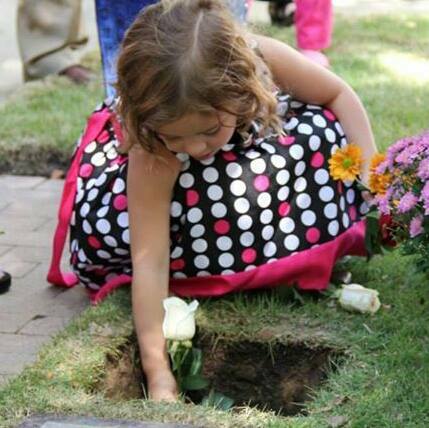 My hope is that every grieving parent will have the opportunity to read this. I read it mostly on a road trip too and cried the whole time. It’s hard not to. The stories are amazing. I hope it gets distributed widely! anotherjennifer recently posted..Wordless Wednesday: Merry Christmas! My eyes were watery throughout this entire post. My heart even hurts a little bit. Losing a child would be difficult at any age, but losing a full term baby would shatter me. I couldn’t even imagine. I know this book has and will reach the right people. It’s hard to even think about. The stories in the book are from parents who lost children at various stages. One thing for sure is that is always hurts. The book will help a lot of people, I have no doubt. you connect up with such an extraordinary range of people doing good. As I read through the comments and think about my own friends, I think we all know someone who has gone through the grief of losing a child. I’m so excited about the book and the nonprofit organization Alexa is starting! I think this book will help a lot because there just isn’t anything like it around. Alexa’s a smart woman!